So, you’re a mom who wants to bike or jog but can’t go anywhere because you have a baby or toddler. This can be frustrating for sure. My wife and I have five kids and the youngest two still don’t go to school. Even though I work from home, it’s not that simple. I can’t simply babysit and work at the same time. On the other hand, my wife deserves a chance to get out. A double bike trailer is a good solution. 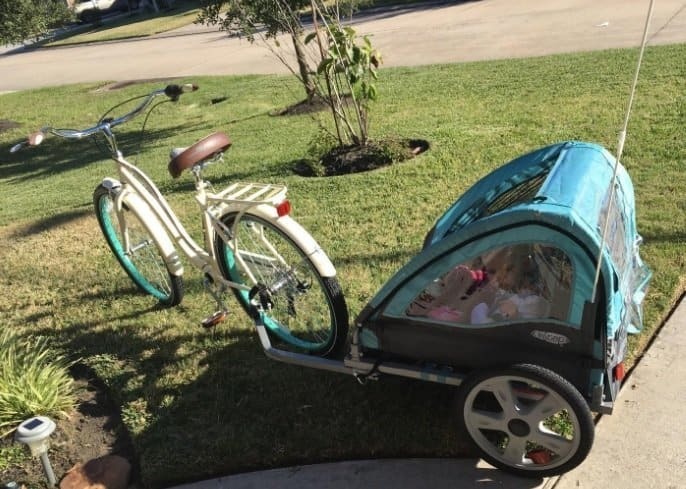 It allows her to take our baby and toddler on the road while getting her workout in. For the times where she wants to run or workout without kids, we have a local rec center that offers to babysit at a low price. Not all bike trailers are made equal. That being said, you don’t have to spend a fortune to get something good. Clearly, the amount of time you plan on using the trailer is important to take into consideration. 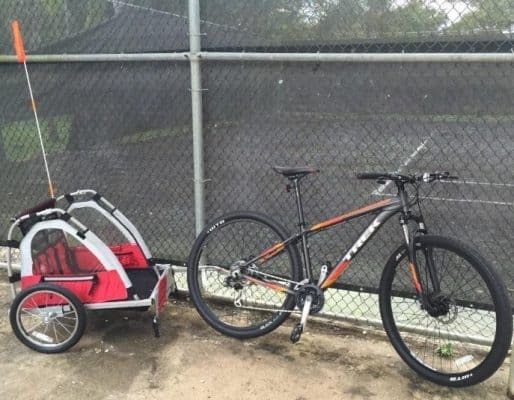 Some can get away with a good bike trailer under $200, while those training for a triathlon may want to get something more expensive in the $300 range. Recessed footwells, 20″ rather than 16″ wheels, and lighter and more durable construction can all be found in this price range. Some trailers are convertible to strollers for jogging, walking, or even skiing. So, instead of getting a separate stroller for running, it might be a better idea to spend a bit more for something that can do both. For those of you shopping for babies, be sure that your child can hold their head up already. Bike trailers are not meant for children who can’t hold up their own head. It’s simply not safe and can affect your child’s brain or neck development. Personally, I’d wait until you child is at least 12 months old to use a trailer. Looking for a good bike trailer but don’t want to spend a fortune? Here are some of the models we recommend. For everyday riders, we’ve also included our favorite $300 option. Ultimately, you’ll have to decide whether you want to go with a budget option or spend a bit more to get some additional features. If you’re still on the fence, here are some additional insights into each of the models we’ve listed above. If you’ve got a budget of under $150, take a look at Pacific Cycle’s Instep Take 2 and Quick N EZ Double Bicycle trailers. 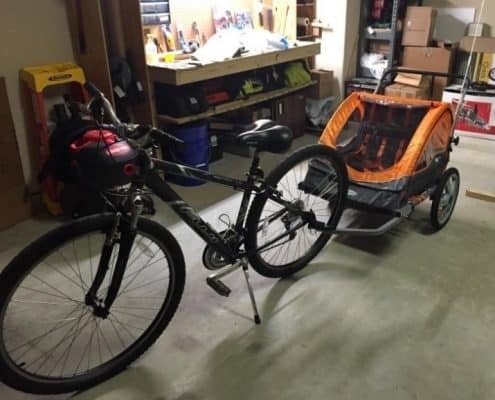 These two models are fairly similar, with the Take 2 being a standalone bike trailer and the Quick N EZ being a convertible stroller bike trailer. Both options are designed for use as a single or double trailer. For the single option, simply place your child in the middle and for double place them side by side. 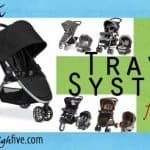 For those of you who have a toddler and are planning to have an additional child, getting a double trailer to begin with might be a good idea as the wider double strollers tend to have a bit more stability. At just around $100, the InStep Take 2 provides a decent value for parents on a budget. While the trailer itself is relatively inexpensive, it’s still very sturdy and safe. Capacity for this design is listed for 2 children who weigh up to 40 pounds each. Clearly, the closer you get to this mark, the more difficult it will be to ride and keep your kids from riding close to the ground in the back. For this reason, I’d say it’s ideal for a 3 to 5-year-old or a toddler and 1-year-old. As it has no suspension, this is something you should know upfront. There’s also an additional storage area that allows you to store some additional gear. This is nice to have if you’re heading out on a trail with your family. While the design is good for the casual riders, I can see it not being perfect for everyone. It’s not a heavy-duty burlap design that you can use for the next decade. Instead, it’s a plastic and polyester design that will last you a few years. This includes a plastic wheel design. If you’re planning on doing several miles every single day, it might wear out more quickly. Considering how expensive some of the high-end bike trailers are, you might be more than fine with that. For safety, the design is sturdy and includes a 5-point safety harness for your child. The Take 2 also includes a safety flag and a rear ventilation window. Overall the Take 2 gives you great bang for your buck if you know what you’re getting. It does the job nicely. If you’ve got two kids older than 3 or 4, I’d probably go with something with more capacity. Assembly is easy, taking about 10 or 15 minutes from start to finish. We recommend it for casual riders. Other than the stroller conversion kit, the Quick N EZ looks very similar to the Take 2. The Quick N EZ is very similar to the model above but includes a stroller conversion kit so that you can use it when you go walking. While it does convert to a stroller, I had trouble getting it in and out of the door. So, it’s not something I’d take shopping or even use somewhere like Disneyland as it’s simply too wide. 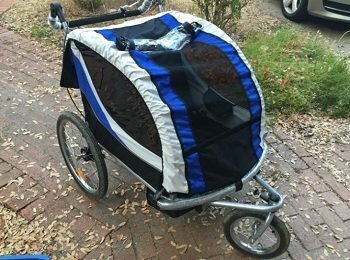 Another good bike trailer for kids in the under or around $100 category is the Allen Sports Steel Trailer. It’s a bit more sturdy than the InStep designs and as such has a higher weight capacity of 100 pounds. Like with the InStep design, this one clearly wouldn’t be very comfortable if you truly had 2 children in the back that weigh 50 pounds each. Rather, it’s better for 2 smaller children or a heavier toddler in the middle. The lightweight and sturdy design make it easy to pull and the sturdy cabin is rainproof and protects your child from any gravel that might enter. For those who want to take this on the road, it has an easy folding design that makes it easy to compact along with wheels that can be removed without parts. The biggest appeal the Allen Trailer has over the InStep ones is that it comes with a metal wheel frame where the InStep uses plastic. As the plastic does wear out over time, this one will clearly last you longer. 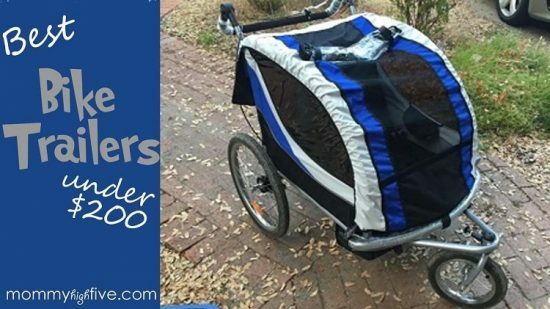 Overall, this is the bike trailer I’d recommend in the $100 category. It’s a bit more sturdy but has a smaller rear pocket for additional items. If you need that storage, it might be better to go with a different option. This is Allen’s most basic trailer option and it doesn’t include a convertible stroller option. For those who want something more mid-range, Allen has several other more expensive options like the XLTX2 and the XLT200. These have convertible features, recessed footwells, and are built better overall. Models like this one in the $100 category also typically have 16″ wheels while higher-end options may have wheels 20″ or larger. With most of these models, an additional convertible hitch can be purchased that makes it easier to take it on and off of your bike.That’s something to definitely keep in mind if you’re planning to take it off and on a lot. If you’ve got a budget of around $200, there are a few options that are really good. In this category, you’re looking for additional stability, a more comfortable experience for your kids, and 20+ wheels. For that, I’d recommend Schwinn’s Echo Double Bike Trailer. The Schwinn Echo gives you more features and a bit more stability than the models above. It has 20″ alloy wheels, large windows for your kids, and a well-made canopy. For protection and comfort, it includes a bug screen as well as helmet mesh and shoulder pads. The Echo can be used as both a double and a single trailer option. To convert it you simply need to move around some of the straps. Unfortunately, the Echo does not double as a stroller option. So, if that’s something you’re looking for, you’ll need to look elsewhere. For storage, there’s a great compartment in the rear of the trailer. The Echo keeps your kids dry in the rain as it includes a rain fly. You can hook it up and take it down in around 3 minutes. So, while it’s not instantaneous, it’s certainly not overly demanding. The tires are fantastic and should last you a long time. In summary, the Schwinn Echo is the best double bike trailer you’ll find in the under $200 price range and is worthy of consideration. It works great on gravel or cement and is a good option for riders going up to 10mph. It doesn’t have shocks, but it’s a soft ride overall as long as you’re not going on rough terrain. If you’re looking for a convertible stroller option, take a look at our final option in the under $200 price range. Although you may not have heard of it, Clevr makes a fantastic budget jogger and trailer that’s worth looking at if you have a budget of just under $200. 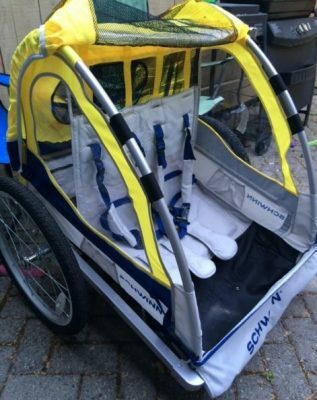 It has a convertible or removable front wheel based upon whether you’re jogging or biking. Unlike other trailers in its price range, this model includes a full suspensions system that makes it a bit more comfortable for your riders. The seats are reinforced and sturdier than other options in this price range as well. For capacity, it’ll work as a single or double design with a combined weight of up to 88 pounds. This one is a bit roomier than some of the other options on here and will likely be able to fit your toddler and 1 or 2-year-old without a problem. For quality, the design is sturdy and lightweight with a 12″ pivoting front wheel you use while jogging and smooth 20″ rear wheels for both. I say lightweight, but the design of this trailer is a bit heavier than others at over 30 pounds. This could be considered a downside; however, it handles much better when going over 10 mph than other trailers on this list. Still, if you’ve got 2 kids that are around 50 pounds and a trailer at 30, you’ll definitely be getting some good calves after a few weeks! Overall, this is a fantastic baby trailer. It works well for moderate riders and is one of the better values out there for the price you pay. Assembly is easy, but the instructions are terrible. So, you may need to look it over once or twice before you begin. I wanted to include another bike trailer on this list for those of you who simply didn’t find what you’re looking for above. If you’re looking for value in a higher-end design, I strongly recommend the Burley Bee. It’s the lowest end model that Burley sells but has nearly all of the features that you get on the trailers it sells for several hundred dollars more. Burley is known as a high-quality manufacturer in the Bike trailer industry. Many people use these trailers for 10 or even 20 years. Their trailers are made of higher quality parts that last a long time. The design shown is the Bee, not to be confused with the Honey Bee which costs around $100 more. 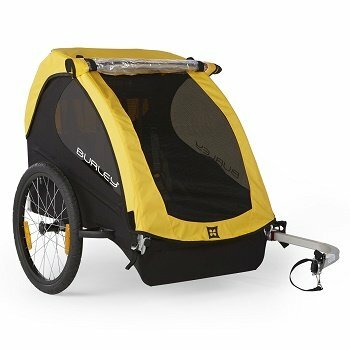 The main difference between the Burley Bee and other designs is that it’s a bike only trailer and isn’t used as a jogger. If you want an inexpensive Burley design that includes a stroller option, go with the Honey Bee I mentioned above. The capacity for all of Burley’s double bike trailer designs is 2 riders at 100 pounds. Unlike many of the other options on this list, this should fit your 4-year-old and toddler without a problem. Like most bike trailers, it has an extensive storage compartment in the back and even better thought out features like a sippy cup holder. Overall the Bee is made of high-quality material and is lightweight and easy to move around. If you’re willing to spend the extra money, I really don’t think you’ll regret it. This is a must for those who will be biking several times a week rather than just on occasion. 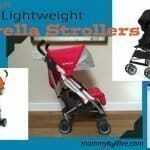 It’s easy to assemble, rugged, and has plenty of space inside for a baby and toddler. Unlike many other options, the Burley Bee is a comfortable ride for even longer rides. Compared to more expensive options, the Bee lacks the hard plastic bottom, hub engaged break, and bowed out sides. That being said, it’s still very roomy and comfortable. A further comparison can be found here from the manufacturer although its specs seem somewhat understated on the site. Finding the right bicycle trailer can be tricky, I know. If you bike a lot, I’d spend a little bit more so you don’t end up purchasing something again in a year or two. The Burley Bee model is my favorite for that group. It’s safe and should last you a really long time. For those who bike occasionally, I really like the Schwinn and Clevr designs. They’re both sturdy and feature-rich for the money you pay. The InStep options, I like as a cheap option you’ll be using on an occasional family outing. I wouldn’t recommend them for long-term use as the plastic wheels don’t hold up on anything but gravel roads. In terms of the convertible stroller designs, it’s not something that I personally use. 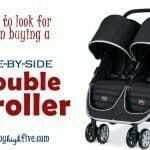 We have a separate double jogging stroller that is a lot more comfortable to use. For the most part, that’s what I’d recommend and especially if you jog a lot as well. Have a question? Leave me a comment and I’ll respond within 24 hours.